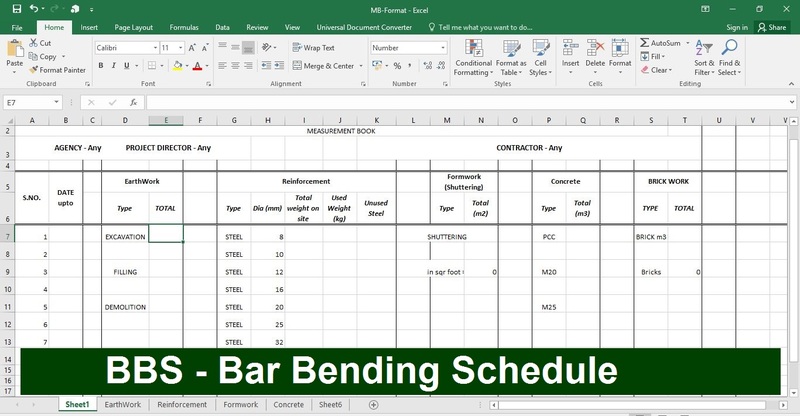 The bar bending schedule calculation (BBS in Excel) is the most important part of steel calculation. Bar Bending Schedule is a list of bar according to the drawing of any structure or element. It includes the cutting and bending length of bar according to bar diameter. For any heavy or complex structure, its reinforcement calculation is very difficult so we are providing a simple calculation sheet for BBS in Excel sheet. It allows you to better management of steel Reinforcement, Brick work, RCC and PCC work, Excavation Etc. in single Excel File. Do all work in digital format. Differentiate between Optimistic Time Estimate and Pessimistic Time Estimate ? Can you please share the link of excel sheet? I wish to show my admiration for your generosity for folks that really need help with this important topic. Your real dedication to passing the message all-around ended up being particularly effective and has continuously enabled folks like me to achieve their pursuits. The important advice denotes so much a person like me and extremely more to my office workers. Thank you; from each one of us. I needed to create you one very little remark just to say thank you yet again for these exceptional knowledge you have shared in this case. It has been really wonderfully generous of people like you to present without restraint all that most people could have advertised for an e book to earn some bucks on their own, particularly considering that you could have tried it in case you desired. The things also acted to be the good way to understand that some people have a similar dreams just like my very own to figure out a great deal more when considering this problem. I believe there are millions of more enjoyable times up front for many who discover your blog. My spouse and i felt joyful that Michael could carry out his survey through the ideas he got out of the web site. It’s not at all simplistic to just always be giving out facts which often the others could have been selling. And we also realize we need the writer to thank for this. These illustrations you’ve made, the simple site menu, the relationships you can give support to create – it’s got most powerful, and it’s making our son and us reckon that that topic is entertaining, and that is wonderfully pressing. Thanks for all the pieces! Hi! I could have sworn I’ve been to this blog before but after reading through some of the post I realized it’s new to me. Anyways, I’m definitely glad I found it and I’ll be bookmarking and checking back often! Aw, this was a very nice post. Spending some time and actual effort to create a top notch article… but what can I say… I put things off a lot and don’t seem to get nearly anything done. Very easy to understand and since is free to download it helps student group a lot. Keep up the great work and thank you for sharing knowledge.